SCATTERED AROUND IRELAND are the ruins of former big houses, lying in overgrown fields and out of the sight of locals, slowly crumbling as the years progress. A reminder of Ireland’s colonial past, many of these houses lie in ruins, the story of their former owners gone untold for decades. Author and photographer Tarquin Blake is fascinated by these mansions, and has been photographing them for years. With the release of his second book, Abandoned Mansions of Ireland II, he captures more of Ireland’s big houses, and the decrepit state in which they lie. The book displays the ruins of buildings such as Elsinore in County Sligo, where William and Jack Butler Yeats spent many childhood summers, and Gortnamona House in County Offaly, built by the ‘heir to the principality of Ofelia’ in 1803. It also features Auburn House in County Westmeath, which was named after the ‘deserted village’ immortalised by the poet Oliver Goldsmith, whose father was a tenant on the estate. “It all started out with the photography,” explained Blake. “I was just looking for interesting photos of ruined houses.” As he started exploring these places, he began “having the most amazing adventures”. When people ask him what it’s like, Blake can only compare it to one thing: Indiana Jones. For this project, it really was like an adventure film, with Blake looking at old topographical surveys to find locations of mansions, and then setting out with maps and GPS to find them himself. With ruins like these, he compares his search to Alice in Wonderland. Blake says that it’s “really amazing what you can find out there”, when you go looking. As I started researching and writing about these places, I found out there’s this whole area of heritage that is really undocumented. It seemed worthwhile to try and get my discoveries published. I started off with website and my first book came out a couple of years ago. Abandoned Mansions of Ireland II focuses on 47 more lost ‘big houses’ and country estates which were built in the 18th and 19th century. “At that time, something like 95 per cent of the farm land was owned by about 5000 wealthy landowners,” said Blake, and the majority of the land was let to tenant farmers, who were dependent on the Anglo-Irish protestant landowners’ land for their livelihood, and had to pay rent to them for the land. In the 19th century, the Great Famine struck Ireland, and the penniless and starving tenants could not afford to pay their rent. This was the beginning of the end for the ‘big houses’, as incomes declined and landowners locked up and left the country. The Land War, agitation against this system, began in the 1870s, while the first Irish Land Act was brought in 1870, beginning the transfer of land back into the hands of the tenants (the final acts were brought in in 1922). Then, during the War of Independence and Civil War, such houses became targets of the Irish Republican Army, with hundreds burnt out. “There are hundreds of these ruins around Ireland,” outlined Blake. “But they’re not well documented.” His book seeks to address this, while also exploring the many eccentric characters that populated these homes. In his research, he discovered information about landowners who were hated – like the Ballysaggart man whose tenants hired a hit man to kill him – and those who were respected, like the landowner who spent all his money importing food to feed his tenants during the famine. The mansions he documents are not in State care or looked after by the Office of Public Works, and in some cases lie virtually unnoticed, a far cry from their position in society 200 years ago. “I’d look at old maps comparing those to Google satellite images and if I saw something interesting there, I would just head off,” said Blake. I’d just explore, put on walking boots and go on through the fields. Most of them are in the back of beyond, in the middle of nowhere. He scours libraries for information and has started collecting books and 18th – 19th century topographical guides to pick up more information. “I love the detective work that goes into it,” said the history enthusiast, who spent two years researching his latest book. He believes his books appeal to people precisely because he’s not a historian or professional photographer (though the quality of his images would certainly make one doubt that). It’s something I’ve fallen into – it’s presented to normal people, it’s not a boring history book. As he has such a passion for the physical remnants of Ireland’s past, it’s no surprise to hear that Blake is working on a third book, which is on general heritage sites. With so many locations out there to explore – “people just don’t know what’s out there” - it’s clear it won’t be his last foray into uncovering more of Ireland’s hidden history. All pictures by Tarquin Blake. 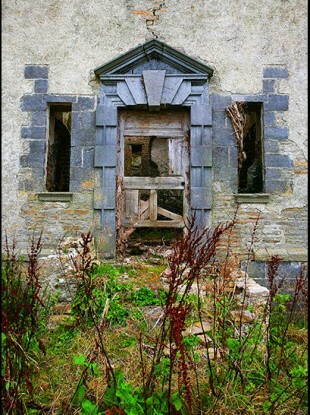 Email “Hidden Ireland: Abandoned and ruined 'big houses' ”. Feedback on “Hidden Ireland: Abandoned and ruined 'big houses' ”.